Three years. Three long years. One man, alone on the moon. Two gorgeous women eagerly await his return. His wife and his infant daughter, a little girl named Eve that he barely knows. A little girl that needs her father. His name is Sam Bell, and his time is almost up. 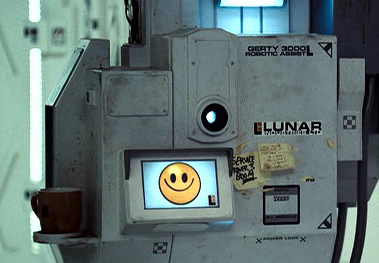 His interactions with the computer GERTY (voiced brilliantly by Kevin Spacey) keep him sane, at least thus far. Things are changing though. Sam is seeing things, the extended isolation invoking hallucinations. It's a long time to be alone so far away from home. Three years. Three long years. Moon is the debut feature film from director Duncan Jones, and what a breathtaking way to start a career. It's a picture that feels limited in scope but it thrives because of the intimacy of the whole experience. Many will see the genre of the film listed as science fiction and instantly imagine going on a journey to distant worlds. They will think of action sequences and hostile aliens and a crew aboard a spaceship on a mission to save the world. Moon has nothing of the sort. 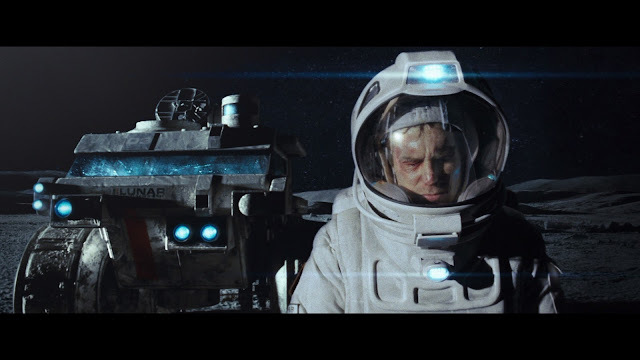 It tells the story of Sam Bell (Sam Rockwell), the only man residing on the moon. His job is to harvest helium-3 and send it back down to Earth where they are using it to fuel the world, but his contract is about to expire. Moon seems so damn simple and yet it feels complex and enlightening when I let it bounce around my mind. It's a beautiful and deeply personal exploration into a few very interesting themes, an example of which is what it means to be human, to feel, to love, to remember. It's heartbreaking, hell, it's more than that. It's devastating and painful with one scene in particular striking a chord in me every single time I watch it. The tears...oh the tears...they come bubbling to the surface and there is no stopping them. Exactly Nathan. I thrive when I get some quiet time, I need it to be able to watch movies and write. I have always been that way. The idea of 3 years of isolation though...it's tough to even comprehend how that would wear on a person. Glad you loved it as well sir.